I loved photographing this bracelet. The soft colors and texture are captured perfectly! 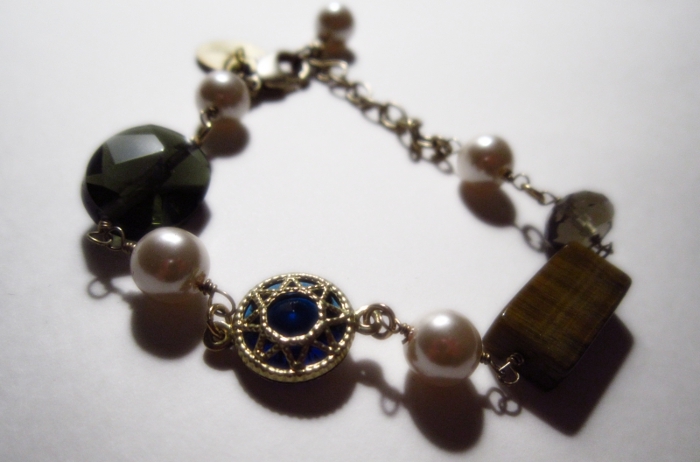 This bracelet is my first "reinvented" piece. Almost all of its components are from a vintage necklace at least 20 years old. The original necklace was in near perfect condition and had little to no signs of wear. The only problem was that the design was quite outdated. The focal pieces was the foundation of the design. This one-of-a-kind bracelet is composed around a vintage, sapphire blue Lucite and brass focal piece. This piece was not original to the necklace and is old new stock in perfect condition. The lovely and realistic faux components, lustrous pearls, tiger's eye, and faceted smokey quartz, create a classic feel to this bracelet, which would be a perfect Christmas, Hanukkah, Solstice, or Kwanzaa present for a mom, beloved mother-in-law, or cherished grandmother. It also make a great piece for holiday dinners and parties. I love the soft effect here. This bracelet looks nothing like the original necklace, which had red Lucite accents and dated gold links. The clasp, extender chain, and wire wrap detail are all vintage pieces in amazing condition. The "believe" charm and rhinestone detail near the clasp are new components that capture the spirit of this piece that I envision as believing in the potential to create and reinvent beauty in the world. The charm adds a touch of newness to old beauty. I like a variety of things to read on blogs, but I especially appreciate tutorials for beginners, or new techniques.